The news all point to 2014 as the year of smartwatches. More and more manufacturers have joined these train and those who already have devices on the market offer new and improved versions. Last week, Google announced its arrival to this world with Android Wear, the Android’s version for wearable devices. Motorola soon announced an Android Wear – based smart watch, which would go on sale in summer. The clock has surprised everybody because it’s be the best designed smartwatch seen until now. It is the first smartwatch that really looks like a watch. It has a round body of elegant and classic style, and it seems like it will be offered with a high degree of customization. In the official announcement, Motorola gave very little information in their blog. The company only unveiled some applications, such as keeping track of time, seeing who calls us or is sending emails, receiving alerts and notifications, using Google Maps …all in a watch that looks like a watch! The news was released last week, and since then there are already circulating rumors about its specifications. Officially, Motorola has not given many details, but, in China, Weibo site have leaked some interesting features. The Moto 360 would have an OLED screen that is always lit when showing the time. This screen would be covered with sapphire crystal, a common component in high-end electronic devices capable of providing high strength and resistance. The company has confirmed that it has no USB port, so it’s likely that it usees a wireless charging system. If these details are confirmed, we would be in front of a high-end smartwatch with probably a considerable price. However, after the excitement that it has created, more leaks will emerge until its official presentation on summer (the exact date is not yet known ). 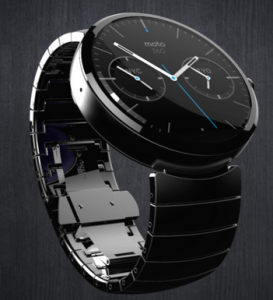 More information at Moto 360.